Thank you so much dear website visitor for taking your valuable and precious time in coming to visit our business website! We highly appreciate your visit and please feel at home and take your time to surf through our site and get to familiarize yourself with what we have to offer you in terms of your real estate needs and wants. And as a Special Thank You for Visiting our Website today, Learn For FREE How You May Buy Real Estate Using Little or None of Your OWN Money at All And Get To Buy Your Dream House or Indeed Any Other Kind of Real Property at The Price You Want by Subscribing to our FREE Introductory Real Estate Email-Course valued at $20 using the Form on the other side of this very Webpage As Well As Learn How To Avoid The 7 Deadly Mistakes People Make When Buying and/or Investing in Real Estate by clicking ->HERE! This is a time limited offer and may be removed at any time without notice and be turned into a Payment Only Subscription E-Course!! So, dear website visitor, take advantage of this very Real Estate Investment E-Course today whilst its still FREE!! Also, Learn How To SPOT and STOP Real Estate Fraudsters and ConMen From Swindling You Your Hard Earned Money by clicking ->HERE! IMPORTANT NOTICE: Please Note That Houses For Rent Are Provided And Displayed Herein On This Website As And When They Are Available To Us. And In Most Cases When Availed To Us By The Distinguished Landlords Upon Request By Them. Or when Would Be Tenants Request Us To Help Them In This Matter At A Fee. WHY? Because Most Landlords Are UNWILLING To Pay Agency Fees. However, In Instances Where We're Being Paid Agency Fees By Specific Landlords, We SHALL Endeavor To Disclose This Information To YOU - Our Valued Client - In Order To Avoid Receiving DOUBLE Agency Fee Commissions As Well As Enable You Verify This Same Info With The Concerned Landlord/s! Moreover, If Any Of Our Estate Agents Including Our Strategic Real Estate Property Consultant Partners Engages Themselves In Any Acts Of Dishonesty Conduct Or Unacceptable Behavior, Then Please Remember To Report Such Behavior To Us Using Anyone Of The Contact Forms On This Very Website So We Can Deal With The Matter Appropriately!! Otherwise, our Specialty is in Home Sales. Moreover, if You or Someone You know is facing Serious Challenges or Difficulties Marketing and/or Selling their own House or indeed any other kind of Real Property and find it Dreadful paying those unnecessary colossal real estate agency fees to the various real estate agents for helping You sell Your house, then please WORRY no more and say Goodbye Forever to such headaches! HOW and WHY? Because their is NOW a SOLUTION to all these challenges to help You solve this problem on Your own and without necessarily engaging the services of any such real estate agents unless You wish to do so Yourself willing! So, read and discover for Yourself how You may Market and/or Sell Your own House as fast as possible and without necessarily engaging the services of any real estate agents whatsoever by clicking->HERE! "SO, HOW DID DAVIK REAL ESTATE AGENCY- ZAMBIA COME INTO BEING", YOU MIGHT ASK? Well, approximately seven (7) years ago, Founder and Principal Agent namely David Kapalu started the Davik Real Estate Agency business in Lusaka, Zambia. The business was born out of an experience of almost getting swindled by some unscrupulous real estate agents in Lusaka when he bought a piece of virgin land in Lusaka's Chelstone Residential Area. After fighting hard for the said piece of land in question, he eventually won the rights of ownership. It was at this very moment in time that it dawned on him to start a real estate agency business whose sole purpose and objective was to educate the general clientele on how to avoid the blunders he made when locating and buying land from the various real estate agents and land owners. And that's how Davik Real Estate Agency was born! At the moment, the business operates as a general partnership and is registered with the Patents and Companies Registration Agency of Zambia. The business is registered as Davik Import and Export and trading as Davik Real Estate Agency (Zambia). As at now, the business is headed for a nationwide expansion program through strategic alliances with other reputable and integrity driven real estate agencies in Zambia. At the moment, we're only catering for Lusaka Province, Central Province, North-Western Province, Copper-belt Province as well as Southern Province based clients including nearby surrounding areas like Chisamba, Chongwe, Kafue, Kabwe, Mumbwa, Mkushi, Luangwa districts including Ndola, Kitwe, Chingola, Mufulira, Kalulushi, Chililabombwe districts, as well as Livingstone and Choma districts located in the Southern Province of the Republic of Zambia. In areas where we are not present, we have entered into strategic partnerships with select few reputable and integrity driven real estate agencies to help our valuable clients buy and sell their properties in areas of their specific choice. • Pre-Sales Services through one-on-one consultation and through a weekly Real Estate E-mail Newsletter based on our desire to provide our valuable clients with Relevant and Insightful Information to help them make informed choices and decisions. • After-Sales Services aimed at developing, nurturing and maintaining long-term relationships with our clients. • Our Listing Strengths in bringing buyers and sellers together. • National Referral Services and Systems through Strategic Alliances with other reputable and integrity driven real estate agencies. • The Combination of Local Area Knowledge and Information backed by the Power of a Strategic National Referral System. • Highly Skilled, Honest Driven, and Experienced Agents concentrating their energies and efforts on the needs and wants of our individual clients. With years of tried and tested experience, Davik Real Estate Agency, happens to have a wealth of knowledge and wisdom when it comes to investing in all kinds of property developments in the Republic of Zambia. As Davik Real Estate Agency, we pride ourselves in being able to find YOU - our valued customer - that excellent house for sale that you might one day call "Home". Or, maybe you might be in the market-place looking for a farm, plot, small-holding, shop/warehouse and/or simply searching for investment real estate like a Mine for Sale for instance. Davik Real Estate Agency - Zambia are the real estate agents that have these kinds of Properties for Sale in Zambia. Therefore, take your time and surf through our site and get back to us using the form provided on the other side of this very page if you happen to have any questions, queries, worries, concerns or indeed any other doubts you might have. We are here for YOU! Just get in touch with us and we shall definitely get back to YOU! Still haven't located that dream Zambian Property or Investment Property of your choice? Well, tell us about it using the web form below or use the contact form on the other side of this very webpage! Just submit your property requirements and/or specifications below and we shall send you a weekly Property E-News Letter packed with valuable, relevant, educative, and insightful information designed to help YOU make a proper and informed decision regarding your choice of property as soon as it's available on the Zambian Market. Moreover, if you're a property owner and happens to have experienced problems or challenges selling and/or renting out your property, then you're also totally FREE and Highly encouraged to tell us about it as well. We shall try our level best to find you the buyers in record time! Or, simply learn how to do it by Yourself by clicking ->HERE! Click Image Above For FREE Details! 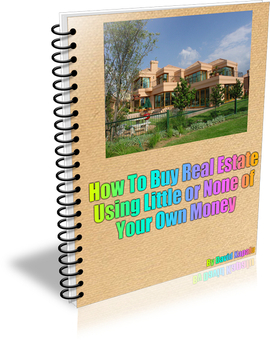 ﻿How To Buy Real Estate Using Little or None of Your Own Money at All Introductory E-Course. ﻿Sign-Up using the form below to get Instant Access to this Powerful and Eye-Opening FREE Email Course ($20 Value Worth of Information). So, Enter Your Name, Phone Number and Email Address below to have Instant Access! And once You've entered Your Contact Details and Clicked on the "Send To Subscribe Now" Button below, You'll Automatically be Redirected to a Secure and Hidden Web-page where You'll have Instant Access. Therefore, Go right ahead right now and enter Your Contact Details below and have Instant Access to this Critical and Valuable Information. You'll be happy You did. ALSO, Tell Us and/or Submit Your Property Requirements and/or Property Specifications using the embedded Contact Form below and we shall send You a Weekly Property E-News Letter packed with valuable, relevant, educative, and insightful information designed to help YOU make a proper and informed decision regarding Your choice of property as soon as it's available on the Zambian Market. LEARN For FREE The SECRETS of Successful Home Mortgage Financing. Click ->HERE for FREE Details!!! NOTE: Are You a Landlord or Know Someone Who Happens to be a Landlord? Do You OWN or know Someone close to You who Owns ANY kind of Rental Property such as Residential and/or Commercial Real Property? Are You or are they COMMITTING ANY one of the following Nine (9) Dangerous and Costly Mistakes Landlords Make Unknowingly? Well, read for FREE and find out for Yourself if You or Those You know and care about are Committing ANY one or more of these Mistakes Unknowing by clicking HERE! MOREOVER, if You're a Real Property Owner and happens to have experienced problems or challenges selling and/or renting out Your Property, then You're also totally FREE and Highly encouraged to tell us about it and/or submit it as well using this very Contact Form below. We shall try our level best to find You the buyers or tenants in record time! Optional but recommended. WHY? Because it makes it easy for us to give You a quick phone call and clarify certain issues immediately rather than later using snail mail! E.g From the Newspaper - Times of Zambia ; Internet - Facebook (Ama Sampo Group) ; Flier ; Booklet ; Magazine; etc. E.g If House for Sale or for Purchase, then state details such as: Number of bedrooms, Where located, Maximum and Minimum Selling Price and/or Buying Price, etc.